At the age of 32, when she was finally diagnosed with severe dyslexia, Linda G. Tessler's word fluency tested on a third-grade level. Yet, in spite of the challenges, she earned a Ph.D. and became a clinical psychologist. 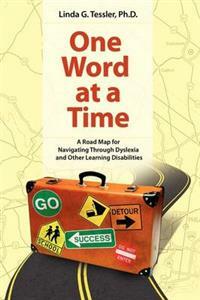 One Word at a Time: A Road Map for Navigating Through Dyslexia and Other Learning Disabilities is Tessler's brave and honest account of her lifelong struggles with dyslexia. Interspersed is compassionate advice and practical strategies - culled from her experiences as a psychologist and scholar specializing in learning disabilities and as the parent of a son who struggles with dyslexia. Bringing together sound psychological principles with personal knowledge, Tessler has created a unique and groundbreaking resource guide that is informative, insightful and inspiring. Easy to read, One Word at a Time is the one book you must read about dyslexia.